Team 1259 Paradigm Shift is a FIRST Robotics team at Pewaukee High School. Paradigm Shift, functioning as a small business, partners with professional instructors, engineers, and business mentors who intern students to solve complex problems through engineering, science, technology, and business principles. Started in 2004, Paradigm Shift is now in its 16th season and stronger than ever as the team continues to grow and thrive while further broadcasting the message of FIRST. FIRST Robotics Team #1259 - Paradigm Shift, from Pewaukee High School, is a business and our product is our students, each one graduating prepared to make a difference in the world. We are a group of innovative students and mentors who have successfully participated in FIRST Robotics since 2004. FIRST stands for, For Inspiration and Recognition of Science and Technology (www.firstinspires.org). 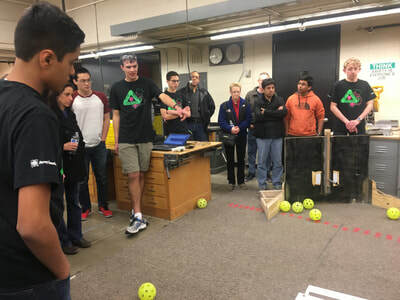 Kicking the season off in January each year, FIRST Robotics teams worldwide receive a themed game full of competitive tasks, and have six weeks to design, build, and program a robot for the regional competitions. The top teams from each regional go on to compete at FIRST Championships held in April each year. Click here to learn more about FIRST! There is so much more to it than just building a robot! Our team is comprised of multiple sub-teams, each responsible for carrying out an essential role to the team. We have participated in many events within our school district as well as in our community. In the past, we have shown off our robot and our members at school assemblies, our local Homecoming Parade, as well as at our schools Relay for Life celebrations. We also interact with younger students at our local Middle and Elementary schools through having some of our team members mentor our local FLL team (FIRST Lego League). Click here to learn more about our outreach efforts!